We have sooooo much kale, collards and chard. I can only use so many in my green smoothies, and we have so many other kinds of salad greens that we just aren’t using these up fast enough and they are about to be too big. 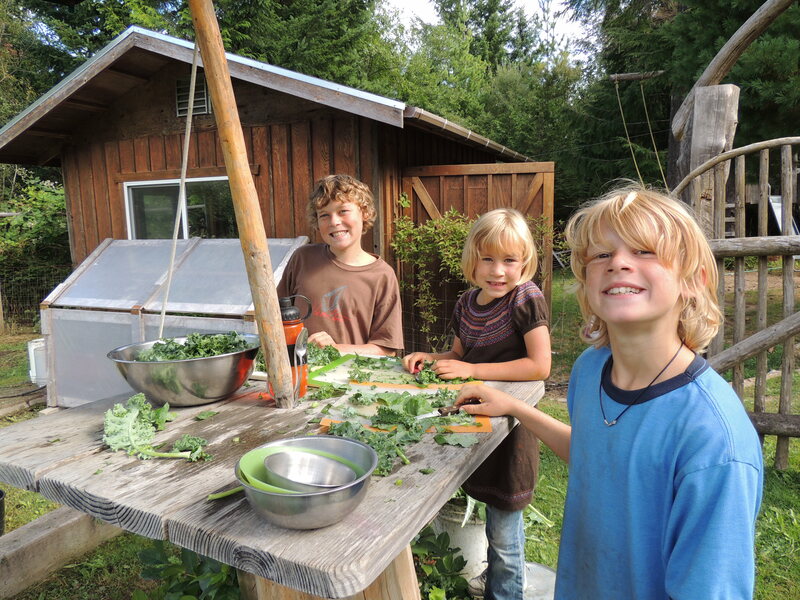 So we are harvesting, blanching and freezing some for our homeschool lunch soups. Most days, during the school year, we eat soup for lunch. It’s the easiest, healthiest, simplest lunch I have come up with. We are are all home, 3 kids, me and the husband, for most every lunch time. Soup it is. 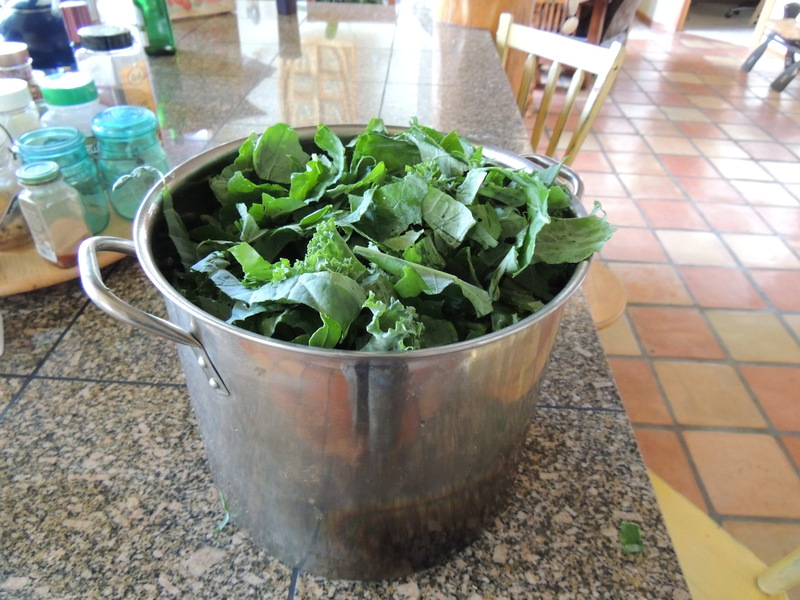 So, it’s great to have blanched greens ready for the soup pot. Today we made 15 baggies full. First we harvested, then we cut the middle stems off and chopped the leaves. We had 3 huge kettles full. 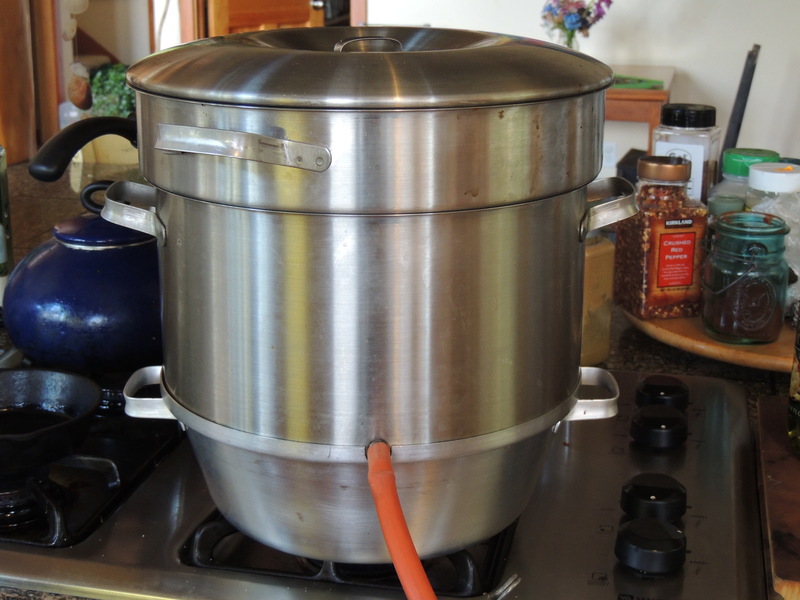 Then I steamed them in this apple steamer. This is the first time I have used this awesome contraption for greens. Normally I only use it for making apple sauce, but today I thought it would work great for greens. I am a genius! It could hold like 3 times what my normals steamer basket holds, so I saved tons of time! I got this a few years ago for $3.00 at a garage sale! Woo-hoo! After they steam for just a few minutes, put them in a sink of ice water. I cleaned, scrubbed and bleached out my sink (Flylady would be soooo proud). Then I added a bunch of ice and some water. 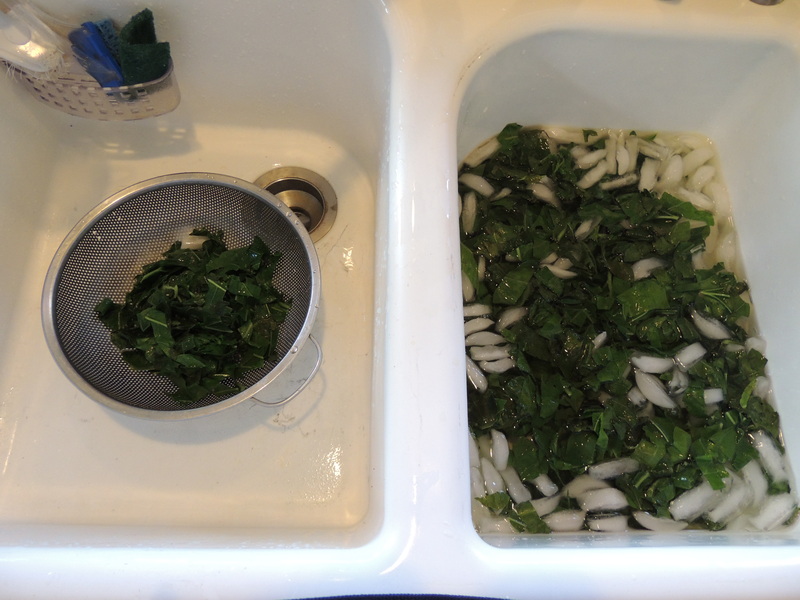 Put the steamed greens directly into the hot water, then strain in a colander and put in quart bags. 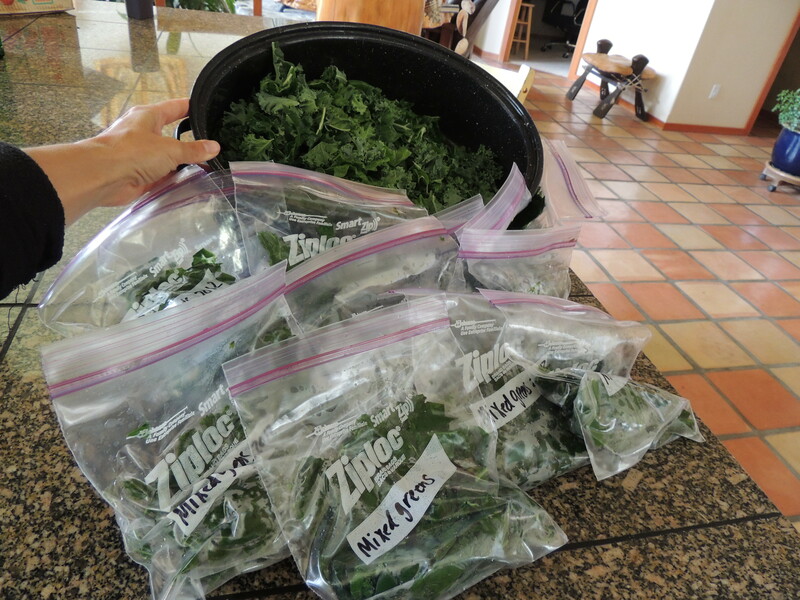 Freeze summer time greens for soups in the winter. Photo tutorial. 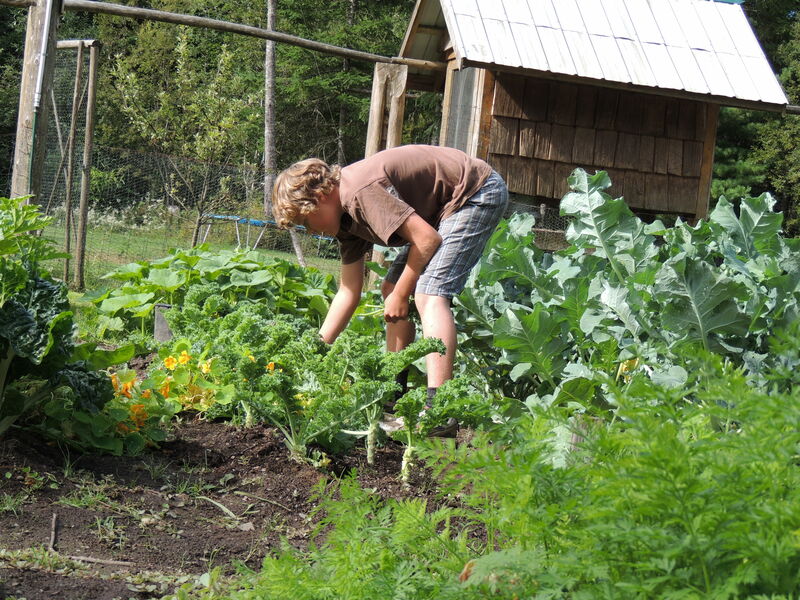 This entry was posted in Food For The Good Life, Self Reliance, Simple Living and tagged vegetarian. Bookmark the permalink.